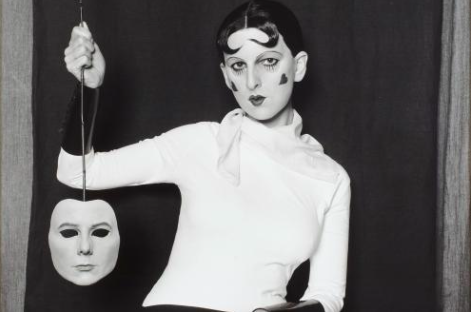 Who knew Claude Cahun and Gillian Wearing would make such a brilliant team at the NPG? Whoever came up with the notion of pairing Claude Cahun with Gillian Wearing at the National Portrait Gallery deserves a pat on the back. Make that two pats on the back — one for each artist. When you pair Cahun (1894-1954) with Wearing (b 1963), you pair not only the past with the present, but the French mind with the English; the age of surrealism with the age of narcissism; the old rules of photography with the new. The result is a fascinating game of identity ping-pong that serves and returns with bewildering complexity, as two fierce obsessions with the self attempt to fit themselves into a single show. Cahun is already a bewildering presence. Although she lived through the key years of French surrealism, her art was largely unknown until its rediscovery in the 1990s. I remember the moment. Few had heard of her. Suddenly she was ubiquitous. 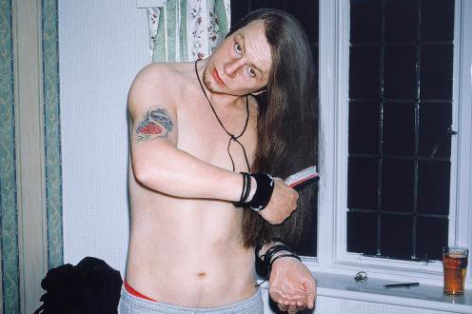 And the rebirth was on cue to legitimise an obsession with the self that was coming to dominate feminine aesthetics. It was all so appropriate. If Claude Cahun hadn’t existed, you feel, she would have had to have been invented. I would not be surprised at all if it emerged that she was a creation of that other great self-disguiser Cindy Sherman, and that the career that unfolds for us so engrossingly at the NPG never happened. Not that her story needs more twists. Born into a Jewish family in Nantes as Lucy Renée Mathilde Schwob, she began experimenting with her gender while still a teenager. The first manly name she gave herself was Claude Courlis, after the French word for a curlew, the bird with a hooked beak that makes plaintive sounds on marshes. Then she became Daniel Douglas, after Lord Alfred Douglas. Finally, she settled on Claude Cahun, though deciding upon a persona as flexible as the one scattered about the NPG can barely be called “settling”. There are enough Cahuns on show here to form a Gareth Malone choir — and they could sing both the soprano parts and the baritone. Man, woman, human doll, skinhead, oriental beauty, camp weightlifter, frumpy lady of the manor, 1930s vamp, Christ, Venus, Bacchus, Buddha — Cahun’s treasure trove of identities might be the clearest photographic evidence we will ever discover of the dramatic range of the human self. And to heighten the drama, most of the Claudes make eye contact with us in an especially knowing manner. As you stare at the art, the art stares back at you, and dares you to disapprove. These crazy costume changes are habitually recognised as pioneering displays of identity-hopping, whose recurrent androgyny and slippery sexual codings point firmly to our own adventures in gender. In 2007, David Bowie, the quintessential Cahun admirer, mounted a display of her work in New York to make exactly this point: that she was ahead of her times, and that her issues have become our issues. It’s an unarguable claim, though the current show is as riveting as it is because it also enables other readings. The vintage black-and-white prints from the 1930s and 1940s that constitute Cahun’s artistic legacy are intimate things that need to be leant into and examined. Tiny, silvery, often faded, they have a fragility to them, a delicate intensity that succeeds in making your encounters with her feel intensely personal. She’s your private dancer, dancing not for money, not for progress — so for what? For art-deco reasons, is one answer. When Cahun superimposes a streamlined reflection of herself swimming naked in the water on the same reflection turned upside down, it is enough that the visual rhyme she has created is elegant and elongated. For reasons of surrealism, is another answer. When she pokes her head through a mirror frame or photographs herself inside a bell jar or reclines naked in a garden while brandishing a leopardskin, she’s displaying an appetite for absurdity that is surrealism’s default appetite. A crazy world is getting the art it deserves. My favourite image shows her kneeling naked on a shiny quilt decorated with embroidered spirals, unmistakably a woman. She’s on a porch where the morning sun has picked her out and made her curled-up body feel especially beautiful and vulnerable. She’s wearing an eye mask, but it seems in this instance to be performing a protective task. Thus the androgyny is a central issue in some portraits, but not in all. More persistent than the gender-swapping is an emotional presence that feels raw and tortured. The first portrait in which she appears shaven-headed isn’t a celebration. Made in 1917, it shows the young Cahun leaning hopelessly against a bare wall like the victim of a firing squad. In the adjacent image, she sits scalped and bandaged in black veils, an uncanny prefiguration of an Auschwitz survivor. In these instances, her art emits a note of intense sadness. And we should perhaps go back to her Jewish origins and the anti-semitism she suffered as a child for the explanations. In 1937, to escape the enlarging presence of fascism, Cahun moved from France to Jersey, where she lived with her partner and stepsister, Marcel Moore. When the Nazis invaded the Channel Islands, she launched a heroic campaign of artistic resistance by producing anti-Nazi flyers that she tucked under the windscreen wipers of the island’s touring cars. Imprisoned for her subversion and sentenced to death, she was fortunate to make it to the end of the war. In a showing that I will remember for its delicacy and intimacy, the most moving of many moving moments is a contact print of the images Cahun produced in 1947 to celebrate Jersey’s liberation. Naked under a flimsy white wrapping that reveals as much as it covers, she dances on a wall with the sea behind her, a homemade Jersey Venus, celebrating the alchemical power of art to repel invaders. What a brave and brilliant presence she was. 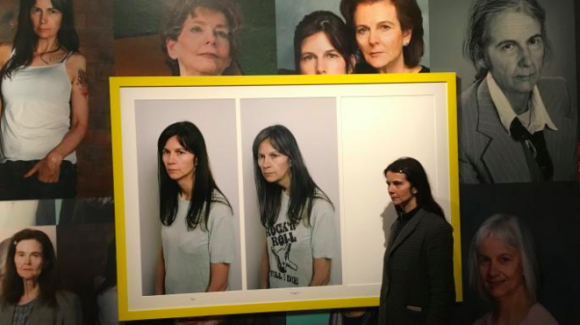 Apologies to Gillian Wearing for taking so long to reach her contribution to the show. It’s not a value judgment. Wearing, too, is a thoroughly engrossing companion whose voyage around herself is plaited with Cahun’s in an exceptionally skilled bit of exhibition-making. Their differences are tonal. For Cahun you lean in. For Wearing you stand back. Where Cahun whispers secrets in black and white, Wearing blares out questions in loudspeaker colours: is it narcissistic to keep looking at yourself; how does a woman grow old; should I resort to the knife or not? She’s from Birmingham, a girl who came to London in 1983 to work in an office, but then decided to go to art college. In 1997 she won the Turner prize. In 2011 she was given an OBE. As a trajectory, it offers a paradigmatic example of the arrival in British art of a new voice: the voice of the attitudinous urban female. Her first contribution here is a set of Polaroids made between 1988 and 2005, in which she records her changing face from 25 to 42. The differences are subtle. A new hairstyle. A different sleeve length. Where Cahun rips up her old identities, Wearing adapts them in the manner favoured on the great British high street: with accessories. As her imagery grows larger and bolder, so too does its complication. What looks like Claude Cahun dressed as an art-deco weightlifter is actually Wearing dressed as Claude Cahun dressed as an art-deco weightlifter. In 2003 she photographed herself wearing a mask of her own face dating from 1980. In a spooky set of family portraits completed in the Noughties, she encases herself in prosthetics and plays her whole family: mum, dad, brother, nan. The result of this inventive wearing of masks and appendages is a self-portraiture that feels blurry. Where Cahun’s costume changes present us with a tangible range of Claudes, Wearing seems shyly uncertain where she begins and ends. So, identities are being jumbled and time is being teased. Time, though, isn’t very good at jokes. And with inexorable force, Wearing’s art rumbles towards a final subject that feels darkly inevitable. A scary last wall plastered with images of Wearing as an old woman supplies her journey with a shocking conclusion. With Cahun, the deepest horror was living in a world controlled by Nazis. With Wearing, it’s growing old.